From Putin to Medvedev to Putin – Continuity, Change, or Revolution? 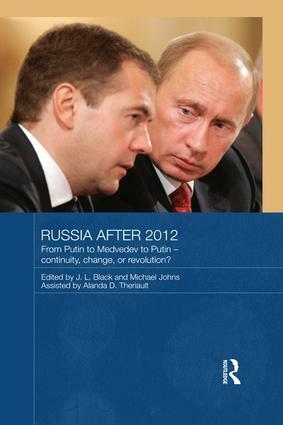 This book provides an overview of the state of Russia after the 2012 presidential election. It considers a wide range of both domestic and international issues, examining both the run up to and the consequences of the election. It covers political, economic, and social topics. It assesses the political scene both before and after the election, and discusses the nature of and likely future of democracy in Russia. The election’s impact on the Russian economy is discussed in detail, as are Russia’s relationships with the United States, the European Union, and other parts of the world. The 2011–12 Russia elections: the next chapter in Russia’s post-Communist transition? Has the Putin–Medvedev tandem improved women’s rights? Russia–European Union relations after 2012: good, bad, indifferent? Russia and Central Asia: does the tail wag the dog?